We offer a special small weekday (Monday to Thursday) meeting package for $175.00. This package is geared to non-profits and small businesses in the area. We enjoy being a resource for local groups to able to meet in our lakeside Events Lodge. Package includes access to the lodge with Wi-Fi from 9am to 4pm. Tables and chairs for up to 25 guests. Projector, screen, speakers, spacious kitchen, refrigerators, fireplace, tented deck, picnic tables, beautiful lakefront lawn, canoes, bikes and nature trails are available for group use. 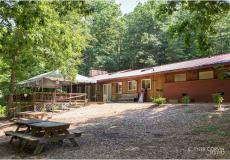 The lodge is also available for larger groups of up to 200 guests. Contact us today for more information. events@montfairresortfarm.com or 434-823-5202.